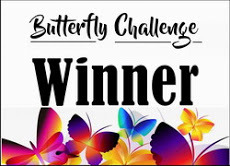 Mrs A has kindly invited me to be a guest designer because I was lucky recently to have been a winner of the Butterfly Challenge. 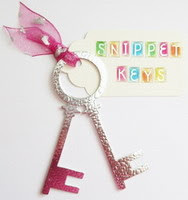 I was given a choice from some letters of the alphabet and as 'V' was amongst them I just had to choose it for the theme which was then paired with the letter D for the colour. So this time we have V for vertical and D for the colour damson and of course butterflies have to feature somewhere. 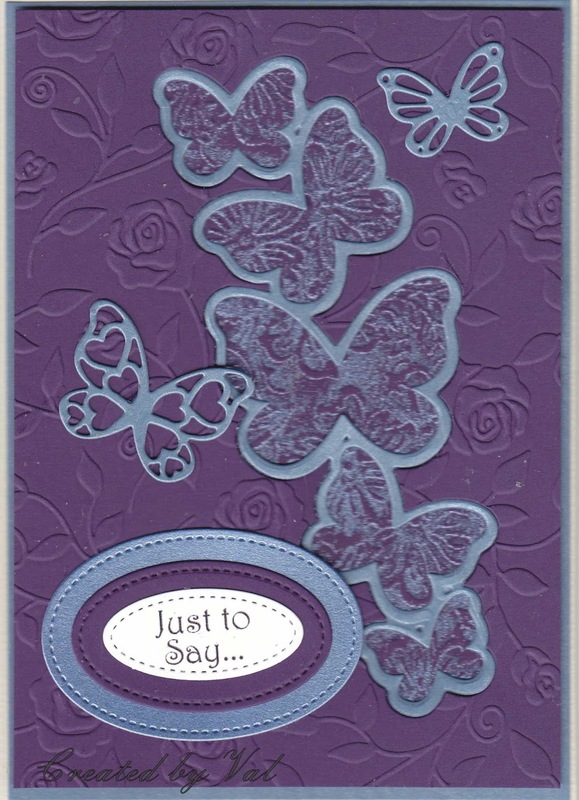 I decided to make a vertical format card using some damson purple card with touches of blue for contrast.Starting with the background which is peeping through the butterflies, I embossed a piece of the dark card before rubbing some Glitter Kiss in blue to highlight the embossing. 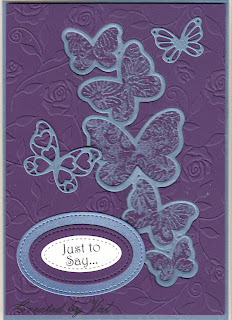 The next stage was to die cut the main butterfly aperture in another piece of purple card which was then embossed. This layer was raised on foam pads over the glitter layer. Another die from the set was used to cut the outline and detailed butterflies using blue pearlised card before popping the outline carefully into the shaped aperture and adding a couple of the detailed butterflies. A slightly larger piece of blue card was cut to go behind the whole thing before popping onto a 5" x 7" vertical card. Finally a computer sentiment was die cut and layered onto ovals cut in the same colours. 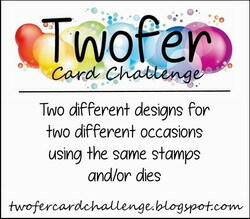 I hope this makes sense to you - actually a much easier card to make than to describe!! 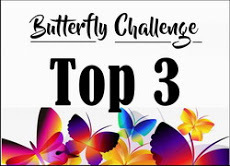 I do hope I have in some way inspired you to have a go and make something to enter into the Butterfly Challenge and as always there is a lovely prize on offer. Sentiment - layers cut using stitched shapes from Stampin' Up. A beautiful card and gorgeous colours too Val. I love the butterfly dies you've used. Hi Val, I've turned up like the so called bad penny again, lol! Lovely butterfly card here and I like the more unusual and clever colours. Actually I've been trying to think of an alternative colour beginning with D and can't unless I cheat and preceed a colour with 'dark', lol, so well done you! Well done on winning the challenge too. 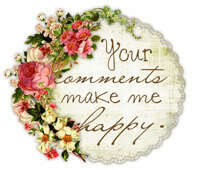 Off to scroll back through your posts now to see what delights I've missed. So that's how you have done it!! Sounds like a lot of work but the end result is one gorgeous card. Those colours are absolutely spot on too. 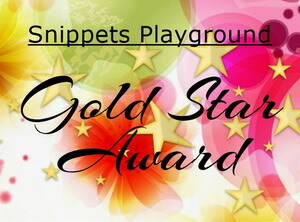 Thank you for being my Guest Designer for this challenge. Hugs Mrs A.